Here’s a picture of the simple puppet head that I made for the first week of Puppet Building 101. While I’ve built several puppets before, what’s different this time is that I am following a pattern this time and doing a lot more hand-stitching rather than using a combination of sewing machine and hot glue. I like the way that it came out. It was a little crooked, I thought, and the fact that I was holding the puppet head in one hand and taking a picture using the other didn’t help either. But I got to practice my stitches and attempt a different way of building a puppet head and that’s all that mattered. The pattern was supplied in the course material. I printed it out, cut out the different pieces, and then traced them onto a piece of fabric. The Stitches In the last post, I mentioned that I was practicing different stitches. I tried to work all the different stitches in. The ears were sewn using locking whipstitches. The back of the head was joined together using a baseball stitch. Although I knew that I should have flipped it inside out and do the stitch on the other side, I went ahead and did it anyway, because I wanted to see how it would turn out. And that turned out to be… not such a great idea. 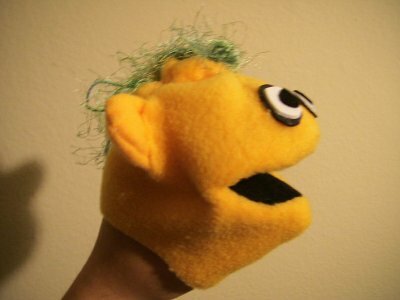 But hey, there’s a reason why I attempted this at the back instead of front of the puppet. Most of the other seams are joined together using the ladder stitch (my new favorite). The top of the head piece was joined together using a whipstitch because it was the fastest, and I am allow to do more of a sloppy job because it will be covered by the hair at the end anyway. The Mouth Piece From experience, the mouth piece is the most tricky part of the puppet, and that’s the case this time as well. One reason was that it required me to line up the mouth board with the rest of the head precisely. And the other reason was that I did not leave enough seam allowance and had to sew through the vinyl (which is more difficult to sew through) sometimes. The vinyl mouth board has an interesting effect, though I am not sure if it was intentional. When I was sewing the mouth board to the rest of the head, I realized that there was no “lip”. But the fabric curled in after I pulled the ladder stitch seam tight, while the vinyl correctly stayed in place. I probably didn’t pull on the stitches evenly though, and the mouth came out a little crooked, I thought. Then again, I don’t remember ever making any mouth boards that’s not slightly asymmetrical. It usually isn’t noticeable anyway. The Decorations The eyes are three layers. They are a piece of felt on top of a piece of white sheet foam over a piece of black sheet foam. They are not totally 3D, but not totally 2D either. The hair is fun fur. The front is glued in place, while the middle and back were attached using several small stitches. I want to allow the maximum flexibility and movement of the hair, so as long as it doesn’t fall off, I am not going to do too many things to keep it in place. That was a fun project, but of course, the most fun part is seeing everybody’s pictures. Although we are all building from the same pattern, many of the puppet heads build are quite unique. My favorite is still the smiling dog built by a classmate. It makes me smile too. This sounds like so much fun, and your puppet looks great! Oops – one more thing. Did you name him? These methods seem very similar to what’s in The Foam Book – and therefore similar to how I make my muppets, since that’s the book I learned from. I may have missed it, but what’s the head made of? It doesn’t look like it’s foam, just the skin covering. By the way, depending on how you attach the mouth, you can have it looking ‘gummy’ or with more of a lip. 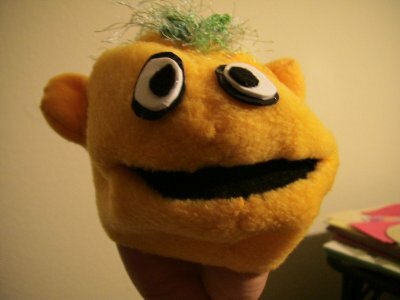 I’ve found that Project Puppet patterns tend to look more like they have lips, and Foam Book puppets have more of a ‘gum’. Whoops – after all that, I forgot what I was going to say in the first place. Which is that I’m regretting missing out on this course. It looks good! Oh, this is just (anti-pill) fleece. It’s actually left-over fabric, and therefore the same color as Mac and Cheese, and Moostifer’s mouth. Foam is later in the course. I still need to buy foam. I’ll probably be looking into more patterns (including yours) after the course.